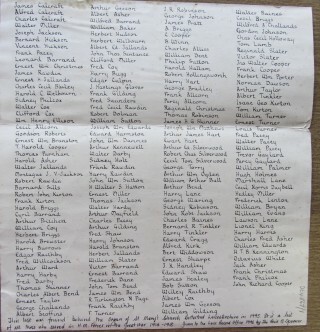 In 1995 the following list was found behind the organ of St Mary’s Church, Bottesford. 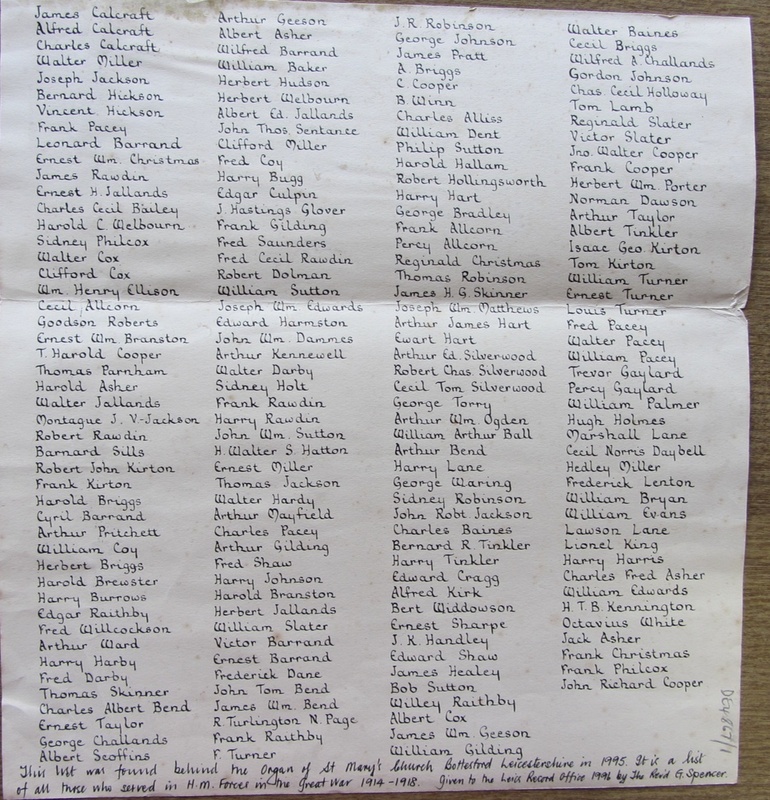 It provides the names of those men from Bottesford who served in the 1st World War. Fortunately the Rev’d Geoffery Spencer donated it to the Leicestershire records Office in 1996. 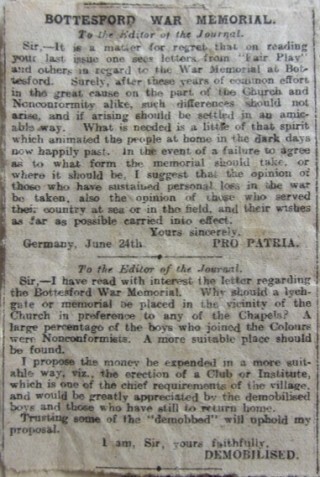 Without it, identifying who from the community saw active service in WW1 would be very difficult. The only other partial listing readily to hand are Absent Voters Lists drawn up in 1918 and 1919. These include full details (eg., name, address, service number, rank and regiment) of those still serving and who registered to vote. Others, such as those who had been invalided out of service, do not appear. The list’s content and layout raises a number of questions. Why was it drawn up in the form presented, by whom, and for what purposes? 184 men are listed. However, the War memorial in St Mary’s records that 186 served from the village in WW1. We can identify at least one omission. Francis William Hilson (30143 Pte, 1st Devons), who lived on the High Street. His name is recorded on the Absent Voters List of 1918 and 1919. One immediate question is why the list found in the Church is ordered in the way it is? Clearly it is not in alphabetical order. To date it has not been possible to work out if they are grouped in terms of regiment as are those on the war memorial. Initial examination suggests not. It could be that they are in some form chronological order of service. It might even be a random listing. Work is in progress to decipher the ordering. However, whatever it might be the list provides some clue as to why it was drawn up in the first place and why it was found at the Church. 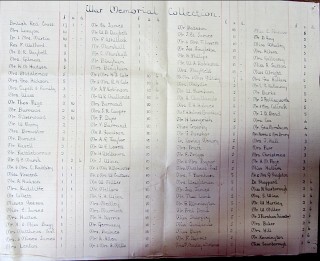 For example, another list was drawn up of those who made donations for the provision of a war memorial. Of note is that both lists are written by the same person: the handwriting is identical. 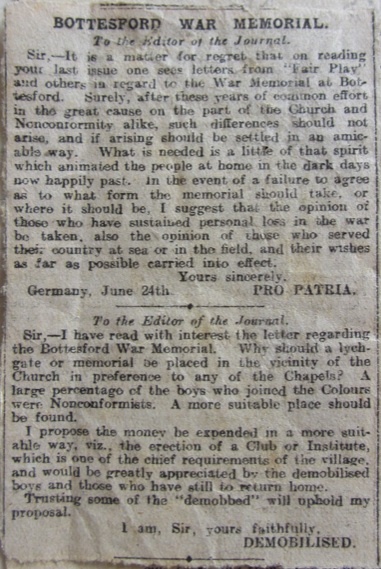 Documents in the Records office and letters to the Grantham Journal also reveal that the debate about the memorial was heated especially in relation to where the memorial should be erected and the form it should take. However, no records appear to exist giving details of any discussion concerning the design of the memorial. Could it be that one proposal might have been to include all who served? The list found behind the organ in 1995 might have been drawn up for just such a purpose. It incorporates both those who lost their lives and those that returned. One of the distinctive features of the war memorial in St Mary’s is that it does not state the rank of those named. It is an egalitarian listing according to the regiment of service. If there had been plans, or discussion, concerning the inclusion of everyone who served, some way might have been sought to name people without reference to rank or station. Who penned the list? Given its location it could have been the Rev’d Walford who had just become the new incumbent at the Church, or maybe one of the War Memorial committee with Church associations. However, it is not written by the same person who kept the brief annotated minutes of the committee discussions. The handwriting of the person who kept the minutes is different from that of the list. Whatever the original purpose of the service listing it provides an invaluable resource for extending our understanding of the nature and range of service in Bottesford during during WW1. Further work on the service listing will be added to this page as it is completed. NB: Reports in the Grantham Journal, June 1919 indicate that Reverend Walford chaired the Bottesford War Memorial Committee. He also appears to have been one of the local news paper correspondents. Reports about the deliberations of the committee closely accord with the meeting notes. It seems likely that the Reverend Walford recorded the brief minutes detailed above. This page was added on 02/10/2012.